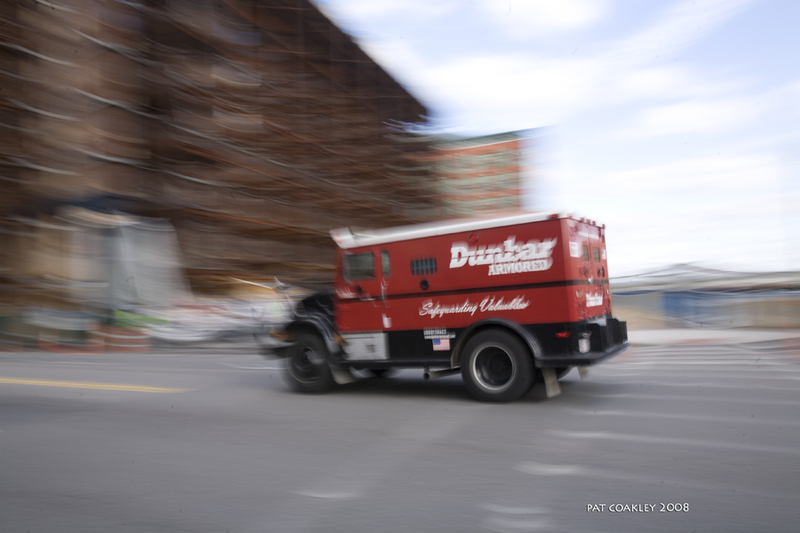 “There goes the money,” I thought to myself watching this armored car fly by me one afternoon in Boston. It was actually the second one I’d seen in five minutes. The first was leaving the Federal Reserve Bank not 100 feet from this intersection. The Federal Reserve Building armored car has no markings and is four times the size of this red one. It is cream colored and could be carrying chickens for all you’d know looking at it from the outside. But, when you see it roll out of the heavily secured rear passageway–with spikes on the lip of the entrance the size of a small person, you get the idea that something more than poultry is being hatched in the windowless section of this corner lot. Me? I think it’s a Wooly Mammoth in there. I am starting a new series, called “Net Worth”, (provided my migraine goes away) and let’s just tackle this elephant in the room together, shall we? You take one leg, I’ll take the other, the fittest of you can climb up on those ivory tusks and tie a big ol’ rope and then jump down, then we’ll wrestle this wooly behemoth over on its side so it doesn’t look so scary and then I’ll serve my favorite wings and we’ll talk net worth and self worth. Just don’t anyone tell me that money doesn’t matter. No, don’t be doing that or else you may find yourself skewered on one of those spikes in the Federal Reserve driveway or on that ivory tusk right to your left, next to my special wing sauce with Kikkoman’s AJI-Mirin sweet rice seasoning in it. Now, you, sandysays1, can have some wings and special sauce! Humor is what is needed at this discussion and happy T day right back at you. Money doesn’t matter…to those who have too much of it. I like this shot, nice feel. And the writing on the side says “Safeguarding Valuables,” but at first glance, I thought I saw “Significantly Vulnerable.” Hmmm. Oh, Mt. Brooks, you, too, can have some wings and sauce! “Significantly Vulnerable” is just too wonderfully, sadly true. And, now that you point it out, I also see it!! Together our net worth may not increase, but our self worth just might. My mother used to say ” Rich or poor, it’s better to have money”. Akin to mtbrooks’s explanation that it only doesn’t matter to those for those who have too much of it. I have envelopes on the desk that I won’t even open. I know there will be minus signs where there used to be pluses. Let’s not open the envelopes, and limit the intake of news to once a day or once every other day. And those cookie jars? Great places for stashing quarters. Even my aspirin has a headache……. Bonnie girl, I’ve been managing news for the past two months and limiting every nuance that is possible to limit. It’s a worthy blog subject right there: how damn near impossible it is to avoid “the” news. I think when one is single and “it” in the taking care of yourself in old age department AND have longevity in your genetic code, this crisis is impossible to avoid. I have literally done my absolute best to manage the fears but it is an ongoing battle and I think revelatory in so many ways about truths that I am late to realizing. At the same time, where there is high level of fear, and I see and hear it every day from others as well, there is the stand out investment that never tanks: creativity. Seriously, it has saved me. And, words from fellow travellers, like yourself. Armoured cars scare me. whenever I see one parked to collect money I always give it a wide berth because I don’t want to get caught up in the cross fire of a hold-up. I resent that other people’s money concerns can put me in danger and I’m with you in spirit on your quest to bag such beasts (such as fear) and get them away from us. By the way, money only matters when you don’t have any. Now, I confess, I didn’t think about getting caught in the cross fire, but now that you mention it….this is my last photo of an armored vehicle!